I went out pretty hard on my most recent training block, lots of max effort intervals and climbing out of the saddle up some steep hills. I started to develop a huge knot in my trapezius between my right shoulder blade and spine, but since the good weather wasn't going to last, I kept on riding. I ended up having to abort my last ride and limp home in extreme discomfort - that was 4 days ago, and since then I've been on a steady diet of T1, T3, Robaxacet, heating pads, laying down, and pestering my partner for back rubs, none of which seemed to be fixing the problem. 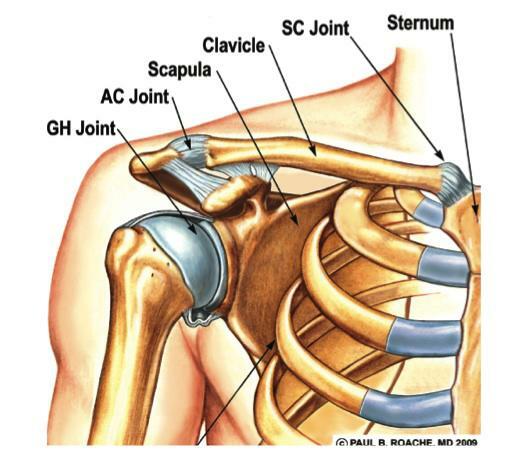 So, how to treat the AC joint? Really simple, you just take two fingers and rub it for a minute - it will feel tender pretty quickly. Then I left it alone for about 15 minutes and repeated a few more times before bed. This morning, I woke up and I could tell immediately that the knot in my trapezius was nearly gone. What a relief! Update on this issue: While the AC Joint massage helped, it didn't fix the root problem - the neck and shoulder pain returned, and I've been struggling with it for almost 4 weeks but have finally found the root cause. Not surprisingly, it's technique, specifically posture on the bike. Once I consciously engaged my core muscles more, which in turn reduced the load on my hands and shoulders, the knots are slowly working out. This is great! I have the same exact problem. I have been working on stabilization exercises. Particularly, swiss ball planks, standard planks, & yoga have helped a bit.